2016 is turning out to be a good year for General Motors as Buick, Chevrolet, and GMC all score above industry average (and close to the top) on both the J.D. Power Initial Quality study and Dependability study. The Initial Quality study looks at problems experienced by almost 80,000 new vehicle owners during the first 90 days of ownership. The study uses the average number of problems per 100 vehicles and those with a lower number rank higher. 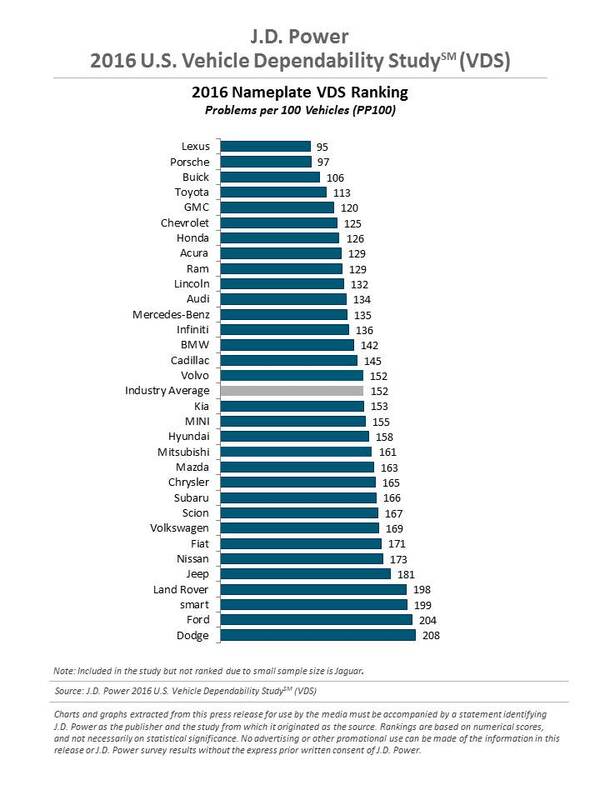 Chevrolet and Buick score 6th and 7th respectively on the study falling behind Kia, Porsche, Hyundai, Toyota, and BMW. However, just because they are 6th and 7th in rankings does not mean it’s a bad rank. Only 3 points separate #3 Hyundai and #6 Chevrolet. GMC also scored above the industry average of 105 problems per 100 vehicles with 103 falling just behind Ford but well ahead of Ram, Dodge, Chrysler, and Jeep. At the bottom of the list are Volvo, Fiat, and Smart with other notable premium brands such as Mercedes-Benz, Audi, Jaguar, and Land Rover all ranking below the Industry average in initial quality. The dependability study looks at the reliability of 3 year old vehicles from almost 34,000 owners. This study also uses the average number of problems per 100 vehicles and those with a lower number rank higher. The most common problems that this study found was with in car technology. Namely mobile devices not connecting via bluetooth or owners finding navigation systems inaccurate or difficult to use. 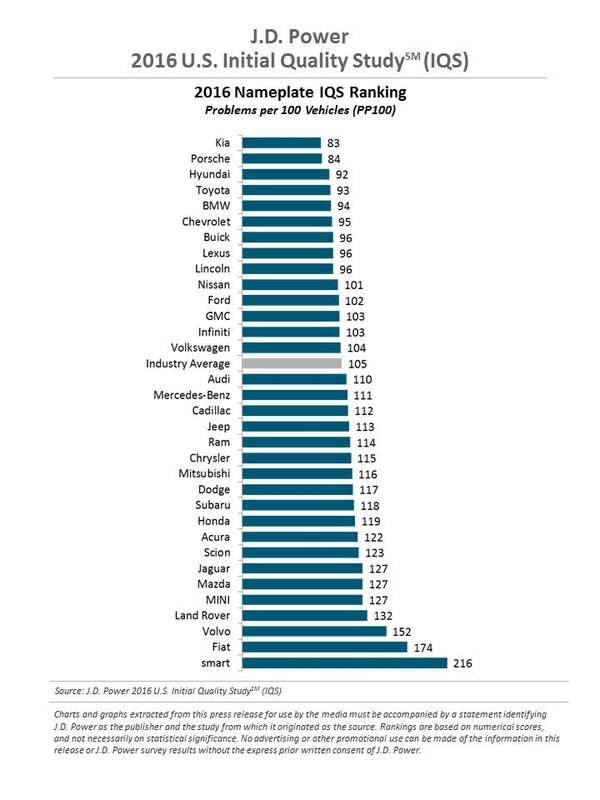 In this study, Buick is the top brand from General Motors placing in 3rd place behind Lexus and Porsche. In 4th place came Toyota with 113 problems per 100 vehicles while GMC and Chevrolet rounded out the top 5 places with 120 and 125 problems per 100 vehicles respectively. GM vehicles finished well ahead of their American rivals, in fact, Ford and Dodge rounded out the bottom 2 places with 204 and 208 problems per 100 vehicles respectively. Unfortunately Cadillac did not do as well as the other GM brands in both initial quality and dependability studies. In the initial quality study, Cadillac placed 3 spots below the industry average while in the dependability study, it did a bit better by placing 2 spots ahead of the industry average.